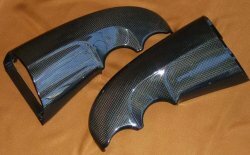 'Real' Carbon Fibre kit includes: Air Scoops, Headstock Infills, Rear Mudguard, Front Mudguard, Side Panels and 'H' Manifold covers. Massive savings when ordering this set. Please note: This kit does not include the Dummy tank cover or the clock surround. 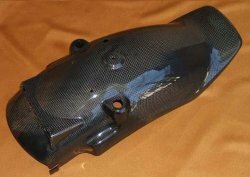 'Real' Carbon Fibre Dummy Tank Cover, fits as original. The most futuristic motorcycle headlight unit, beautifully finished with twin parabolic single filament H3 (55w) bulbs, (one lit for dip, both lit for main beam).Light units. Mounts to original top cowl & Yam badge fixings. 'E' marked, ie certainly street legal for Europe, (possibly the World). Supplied Complete, ready to Plug in and Bolt on. 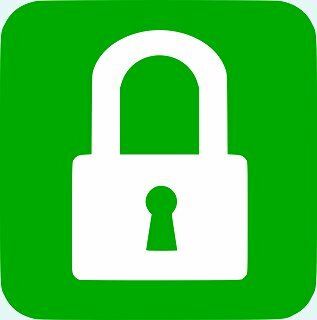 Note 1:- We do not drill the holes in the side of the "Cyber" for the indicators, as we do not know 1) If indicators are to be used in that position? or, 2) What size ? 3) If we were to, we may have done wrong!. 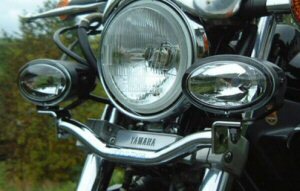 The ONLY Motorcycle headlight (in the world ever) to have had it's own "Club" "THE CYBERMAXERS CLUB UK". Note 3: Any of our Gen1 screens shown in the 'Touring' section will fit to this. Old 55w to Fantastic 100w piece of kit. HID (High Intensity Discharge) Xenon headlights in cool white. Installation is Plug-N-Play and is simple enough for a first time installer. Our kits plug right into your existing assembly and all necessary hardware for installation is included. Almost 300% in increase in light output. It will make your headlight shoot further ahead of the road giving you much more reaction time, which means increase in safety. Please see 'click on' picture for full kit. 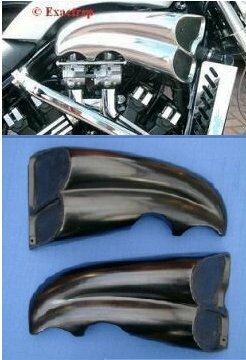 'Judge-Max' Headlight / Speedo cowl, will fit with Standard headlight or our twin headlight units, mounts to standard Indicator mounting bracket or our 'Cybermax' #43 headlight unit. Can also be fitted with 'Cyber-max' Headlight for a different look!! 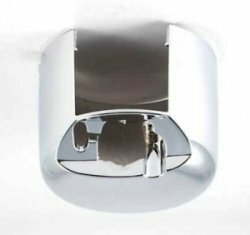 Twin 4" 1/2" Bates style Headlights both with High and Low Beam, including Polished Stainless Steel lower Mounting Bracket. Simple to fit, bolts straight on (no mods) & plugs into to original equipment. 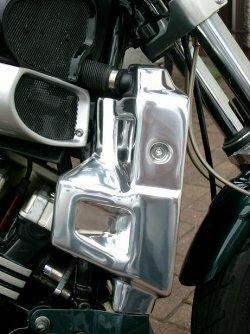 Yamaha Badge can be re-fitted over support bracket supplied as shown (with removing the two lower original headlight support lugs). Note: shown with our Polished Infill Ref 52A and Sports Fly Screen (see click here). Note 1:- We do not drill the holes in the side of the "Infill" for the indicators, as we do not know 1) If indicators are to be used in that position? or, 2) What size ? 3) If we were to, we may have done wrong!. Note 2: Any of our Gen1 screens shown in the 'Touring' section will fit to this. Made from Steel, Chrome finish. Note: Does NOT come with lights, bracket only. Wonderously good looking, (almost as Yamaha intended?) + uses as original 'H4' type bulb, and works brilliantly. 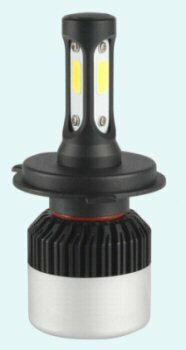 Even better with the 100 watt bulb, HID H4 bulb or LED Bulb option. 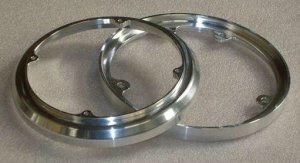 Fits into the original headlight unit, or can be used with the 7" headlight conversion. Available in Black, complete with lights, uses H4 bulbs. 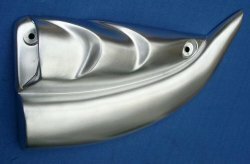 A) © Mega-air-scoops in polished aluminium (as shown here). 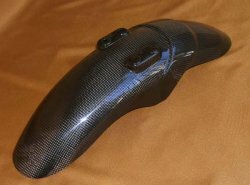 Supplied with black backing for "intake"
Pair £265.00 ($345.00) -- £318.00 Including VAT at 20% © 1997 Exactrep. 1985 - 2007: £215 - £240 each + VAT = £430 - £480 a pair + VAT! 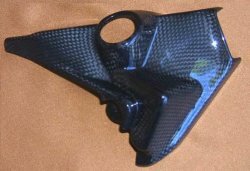 Injection moulded Black Plastic with Hydrographic Carbon print. 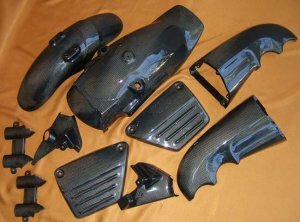 Note: Does not look like/match the Genuine Yamaha carbon fibre, nor our 'real carbon fibre'. 2009 > onwards: £250 each + vat = £500 a pair + VAT! 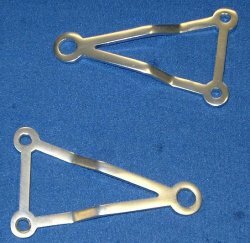 Aluminium Headlight Brackets (pair) to be used with your own supplied fork stanchion clamps x 4. Hole ctrs at 100/95/50mm. 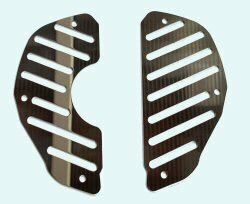 Note: Not supplied with mesh etc..and can be used with all types of 'Air scoops'. Stainless steel fixation screws included. Lazer cut stainless steel Radiator cover (front and sides only). In G.R.P, locates the same as original at 1/3 of the price. Ready to paint prep. In G.R.P., fits and looks same as original at 1/3 of the price. Ready to paint prep. Cast Aluminium, in Lustre finish. Made from Fibreglass (GRP) Ready to Paint. 'Pops' on in 2 seconds, has safety tab to keep in place. Made from Fibreglass (GRP), in hydrographic carbon look. Water Transfer Printing which can also be known as (Hydro Dipping, Hydro imaging, Carbon Dipping, Camo Dipping) is technically a surface decoration technology that takes a specialized film printed with real life looking natural designs. 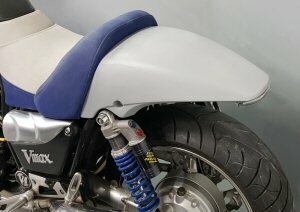 4A: 4" shorter than original rear mudguard, whilst keeping the original style.Injection moulded plastic (the original, quality made items), perfectly smooth inside and outside,does not warp,bubble up after time/heat, constant 3mm wall thickness (unlike all fibreglass copies!) It has the bonus of being lighter in weight than original as you do NOT use the standard steel undertray. Includes twin rear Round light assembly & registration plate bracket. Wiring supplied with simple instructions. G.R.P. Ready to paint prep. G.R.P. Ready to paint prep..
Red or Clear LED tail light. (Genuine, Supplied to us from 'BRM' !) G.R.P. single seat conversion, with integrally mounted hinged pillion seat, giving access to storage space below, (all 6mm stainless steel support bracketry, hinge mechanism, nuts, bots, grommets and washers included). Complete with Tail and Indicator lights. 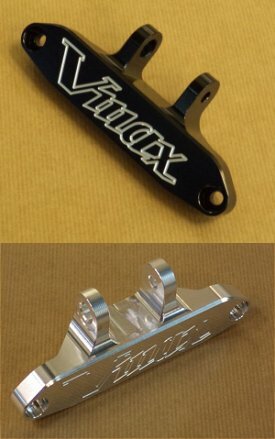 Licence Plate support bracket supplied. Ready to paint prep.. Option1: White LED, Red LED or Grey smoked LED tail light. see click on for more images and different colour tail lights. Option 2: Orange, White or Grey Smoked Indicator lenses, all with 4 x Orange bulbs. 'Street' Tailend made in GRP, ready to paint prep. Includes licence-plate holder, screws and double rear light. The bottom part is sealed and therefore it offers an extra storage capacitiy of aprox. 4 litres beneath the pillon seat. New seat mechanism for the original pillion seat provides simple and easy access to extra stowage space under the seat. 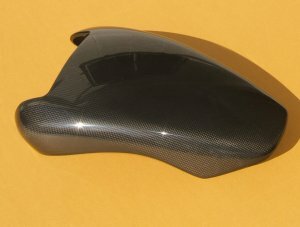 Note:- This item cannot be used with original rear mudguard, or our 'Short tail Mudguard' Ref 4 A/B . 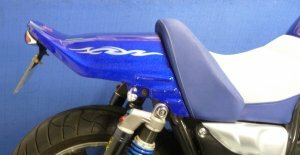 Bellypan made from (GRP) Fibreglass, can be fitted to bike with standard footrests or rearsets. Ready to paint prep. Will not fit with 'Yamaha style original' engine bars. 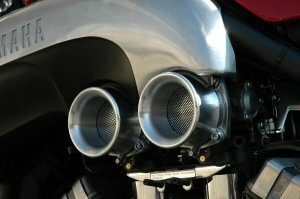 Fits with or without engine bars (original Yamaha or aftermarket #22). Bolts to original engine mounts on frame. Access to oil filter and drain screw retained. In GRP, Ready to paint prep.. Complete with twin parabolic single filament H3 (55w) bulbs, .Light units. Complete with all wiring, seperate fuse and switch gear. 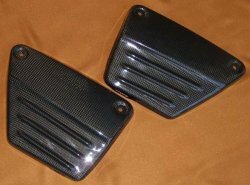 Fits with or without engine bars (original Yamaha or aftermarket #22). Bolts to original engine mounts on frame. Access to oil filter and drain screw retained. In GRP, Ready to paint prep..
As original G.R.P. Ready to paint prep.